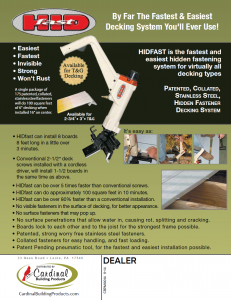 The first hidden fastening system that easily and affordably attaches treated lumber, hardwood, cedar, composite, or PVC deckboards directly to the substructure, creating a beautiful, fastener-free deck surface. How about 30 seconds per board? What makes the HIDfast system so fast? Pure and simple, there is NO hardware! No screws, no clips, no clamps. How about 30 seconds per board? If that sounds unrealistic, then you need to watch this video and see for yourself. All you need is the pneumatic tool, a package of HIDfast fasteners, and a HIDfast rubber mallet that comes with the tool, and you’re ready to go. Now you can install decking 5 times faster than conventional screws, or nails.